343 pages. Duodecimo (5 ½" x 3 ¼"). Bound in leather with raised spine bands and gilt to spine. Originally written in 1619 in Italian. From the library of Lothar Schmid. [Biblioteca van Der Niemeijeriana: 400] Third French edition. Gioachino Greco, also known as Il Calabrese, was born around 1600 in Celico, which near Cosenza in Calabria. Calabria had already produced such players as Leonardo di Bono and Michele di Mauro. From his writing it's apparent the he wasn't educated and likely came from a lower class family. 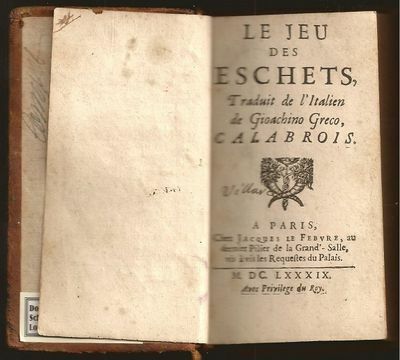 Already in 1619, Greco started keeping a notebook of tactics and particularly clever games and he took up the custom of giving copies of his manuscripts to his wealthy patrons. In Rome Monsignor Corsino della casa Minutoli Tegrini, Cardinal Savelli and Monsignor Francisco Buoncompagni all received copies (of which there are extant copies, dated 1620 in the Corsiniana library in Rome, under the title, Trattato del nobilissimo gioco de scacchi). Despite his popularity in Rome, in 1621 Greco took off to test himself against the rest of Europe leaving this paper trail as he went. In 1621 he left a fine copy of his manuscripts with Duke Enrico of Lorraine in Nancy. He traveled to Paris where he played Arnauld (Isaac) de Corbeville, Enrico di Savoia (the Marquis of St. Sorlin and the Duke of Nemours and Geneva) and others. He had apparently been quite successful because in traveling from Paris to England he was waylaid by robbers who divested him of 5,000 scudi, a princely sum. Finally making it to London, he beat all the best players. Sir Francis Godolphin and Nicholas Mountstephen were given copies of his manuscripts. While in London, Greco developed an idea to record entire games, rather than positions, for study and inclusion in his manuscripts. He returned to Paris in 1624 where he rewrote his manuscript collection to reflect his new ideas. He then went to Spain and played at the court of Philip IV. There he beat his mentor and the strongest player of the time (other than himself), don Mariano Morano. He finally returned to Italy where he was enticed to traveling to the New Indies, the Americas, by a Spanish nobleman. He seemingly contracted some disease there and died around 1630 (possibly 1634) at the young age of 30 (34). He generously left all the money he earned at chess to the Jesuits. Gioachino Greco stood head and shoulders above his contemporaries, a feat seldom duplicated. David Hooper, in The Oxford Companion to Chess, states that Greco probably made up the games in his manuscripts. The question of whether he actually played the games or invented them is rather moot since if he invented them, he was perfectly capable of playing them.